The term Pinzgau is a vernacular one corresponding to the administrative district of Zell am See. It in a mountainous area in the South-West of the Salzburg province and best known for its capital Zell am See, many of Salzburg′s most striving ski resorts and for great hiking opportunities. The Pinzgau is relatively thinly populated, some 85,000 people live there (concentrated in its north). Due to structural problems, the population has been slowly decreasing for quite some time now, at least in the South of the region. Geographically, the Pinzgau is characterised by high mountains, most importantly the Tauern mountain range. The National Park Hohe Tauern is probably the most impressive national park in all of Austria and offers stunning vistas and dramatic scenery. It includes the Großglockner Hochalpenstraße, the panorama road to the highest mountain of Austria. Other geographical features are the Lake Zellersee and the two major river valleys of the Salzach and the Saalach. The most touristy regions of the Pinzgau are Saalbach-Hinterglemm, various small communities in the National Park Hohe Tauern, Saalfelden, Kaprun, Dienten am Hochkönig and Zell am See. 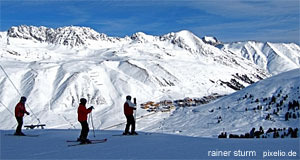 The main share of tourism occurs during the skiing season. Glaciers such as the one on the Kitzsteinhorn or the Hochkönig mountains allow summer skiing. Nevertheless, summer tourism focuses on hiking and other alpine sports. Ever since 1873, there is a railway link between the Pinzgau and Tyrol. This and later the motorway have made the Pinzgau in important trade and transportation route. The Pinzgau was a traditionally poor area of Salzburg. This changed only with the rise of skiing tourism in the 1950ies. Today, some of Salzburg′s wealthiest communities can be found in the Pinzgau, even though unemployment and unsatisfactory coverage of infrastructure remain issues in some areas. Historically, the Pinzgau has emerged from three counties (Unter-, Mittel- and Oberpinzgau), all belonging to Bavaria since 923 A.D. From 1328 to 1816, it was part of Salzburg (as an independent state), since then, the Pinzgau is Austrian. The Pinzgau currently has three cities (Zell am See, Saalfelden and Mittersill) as well as four market towns (Lofer, Neukirchen, Taxenbach and Rauris). In addition, there are several other municipalities: Bruck an der Großglocknerstraße, Dienten am Hochkönig, Fusch an der Großglocknerstraße, Hollersbach im Pinzgau, Kaprun, Krimml, Lend, Leogang, Maishofen, Maria Alm am Steinernen Meer, Niedernsill, Bramberg am Wildkogel, Piesendorf, Saalbach-Hinterglemm, Sankt Martin bei Lofer, Stuhlfelden, Unken, Uttendorf, Viehhofen, Wald im Pinzgau and Weißbach.